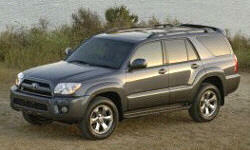 Toyota 4Runner Pros and Cons | Page 1 of 3 | Why Not This Car? Love the truck feel, sitting up high, ruggedness. This thing is over-the-top-reliable. I take it off-road, slam the under-belly on to rocks, bull it over large stones like a Hummer, pull over 10,000 lbs for drives well over 2 hours (it stinks of sulfer on the hills but...) - only in shop for oil/brakes. Robust and desirable styling, will stand the test of time like older Landcruisers. Form follows function overall. Classy yet low key demeanor. Definitely a masculine design with restraint. 2010 and newer more "butch" and stylized. 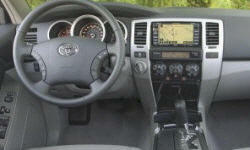 The 4Runner is a fantastic "go anywhere" vehicle..IF you need that sort of thing. The base SR5 will not go in a straight line, it leans like a boat around curves and dives when braking. Very bland.Poor layout, materials are questionable. This SUV drives more like a sports car, probably due to its XREAS suspension feature. Never used to tow, but interior cargo is excellent. Fold down rear seats allow loading 16 bags of 2 cu. ft. mulch, etc. Comfortably spacious for five persons. luggage container can be fitted to roof rack. Reliability and durability proven by years of real world useage. It had a lot of road noise.